It would be nice if the site used a more Mac Classic layout instead of the current one, which is neither modern nor retro, just... strange. 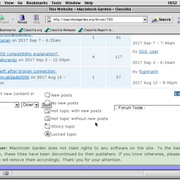 The top menu links for example could be in a simple toolbar with classic MacOS icons, instead of grouped at the top right with text alone. Let me know if you need help because I've been developing websites since 2002, and I'd like to improve the site because it has great content. Use the contact form and it'll be forwarded to me. I'm currently away on vacation but I'll be home this weekend. There's already work being done one getting a classic look and feel to the entire website, with a couple of suggestions you have already made in other areas on the site. As in, compatible with 68k browsers. As for the IE error, I believe it shows up in some other browsers as well, and I believe it has simply something to do with how the webserver itself is set up, which is something I'll dive into. Hey Fog! Hope you're enjoying your time off this summer! I know there's a bunch of retro sites out there that still load fine on older Macs, while a bunch more load great from the wayback machine that may be worth a gander as well. One that I enjoyed participating in on and off was Dan Palka's system7today.com. I know a few sites still compatible, and that's where I want to take us, to compatibility land. An update to this issue, though long overdue... the website should now be accessible through both the old Netscape browsers as well as the Internet Explorer ones, can't vouch for how pretty it will render though. 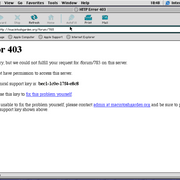 At least the website is (should be) accessible now, though. In case it still throws the same error, reply with date and time of the attempt and I'll look into it.